I’m not used to reviewing books on this blog, but I need to make an exception for the newly published Gardens of Awe and Folly by Vivian Swift (Bloomsbury). It is the kind of book that puts a smile on your face when you look at it on the coffee table. The book that you want to re-read as soon as you’ve finished it. Humorous, imaginative, poetic, tender, insightful, and absolutely beautiful because of the many lovely watercolors by the author. 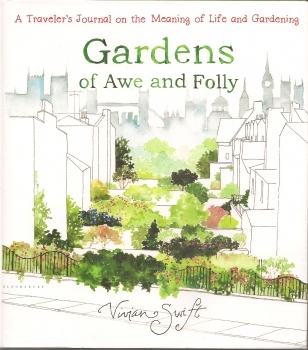 For an idea of chapter one, you can have a look at Vivian Swift’s blog. You will see how much she loves Paris… If you browse to older posts, you will learn more about Vivian’s next project: a book on Giverny, especially on how to paint Giverny. She makes it sound so easy and fun!